Weekend Food, Fun & Sun in Santa Barbara!! 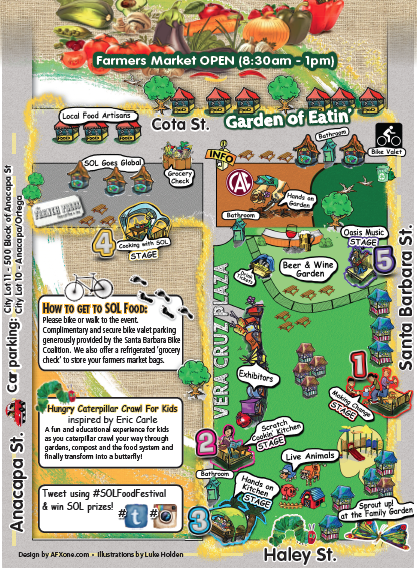 The SOL Food Festival in Santa Barbara has fun for the whole family! Santa Barbara is renowned for it's stretches of sandy beaches, exciting events such as the SB International Film Festival and of course, it's profusion of delectable culinary offerings. But restaurants and cafes aren't the only spots in Santa Barbara you will find food and fun combined! Santa Barbara residents and visitors regularly enjoy festivals and celebrations that prove to be a feast for all the senses! Santa Barbara offers year-round opportunities to appreciate the beautiful bounty of the area. From the Solstice Festival in June to Octoberfest fun, and lets not forget the annual Holiday Parade, each season has it's own way of partaking in the excitement! As we head into the fall season (which, in Santa Barbara, bares a striking resemblance to Summer) harvest fun is everywhere! This Saturday, the SOL Food Festival will pay tribute to local farmers, chefs, and organizations throughout SB County. The festival, which will be held at Plaza Vera Cruz Park on Santa Barbara street between Cota and Haley Streets, will feature several different stages each boasting their own theme such as Making Change Stage and Hands On Kitchen Stage. We've included the festival map to the left! Bring the family out to Plaza Vera Cruz Park for a day of fun, food, music and of course, Santa Barbara sun! Another way to enjoy the beauty of Santa Barbara's fine offerings is directed to our adult residents and visitors. The new "it" locale for laid-back dining and drinking is Santa Barbara's up and coming neighborhood, lovingly referred to as The Funk Zone. This area of SB was once known for its industrial atmosphere, but star chefs, breweries and sommeliers are breathing new life into the area, giving it a relaxed yet stylish feel. New restaurants and tasting rooms are popping up what seems to be weekly, and the activity is getting everyone's attention. This weekend, Santa Barbara County favorite Figueroa Mountain Brewing Company is hosting FigtoberFest in two locations, Buellton and the Santa Barbara Funk Zone. The Funk Zone location will feature beer tastings, guest breweries, wine tastings, food trucks, live music and costume contests! In keeping with the Oktoberfest spirit, traditional German garb is encouraged!! Sunday, work (or watch) off your food/beer coma by heading down to West Beach and take in the AVP Pro Beach Volleyball Tour, going on Friday - Sunday. Click here to buy your tickets to the action!! Riskin Associates invites you to visit Santa Barbara and get a taste of what everyday life is like in paradise!